In addition to searching for black-chinned hummingbirds at the Audubon Research Ranch, I’m also conducting my work at The Nature Conservancy Sonoita-Patagonia Creek Preserve. While this place is less than an hour drive away, it is fairly different from the ranch. The preserve is a rich and lush riparian area, surround by a mesquite filled semi-arid environment. You can easily find multiple hummingbird species here, which makes things a bit more complicated, but there are plenty of black-chinned hummingbirds going to the feeders they have established here. I’ve only scouted here a few times, but I’m excited to continue to work here, because the overall bird diversity is great! Last time I went, I saw over 50 species, including a varied bunting and thick-billed kingbird. 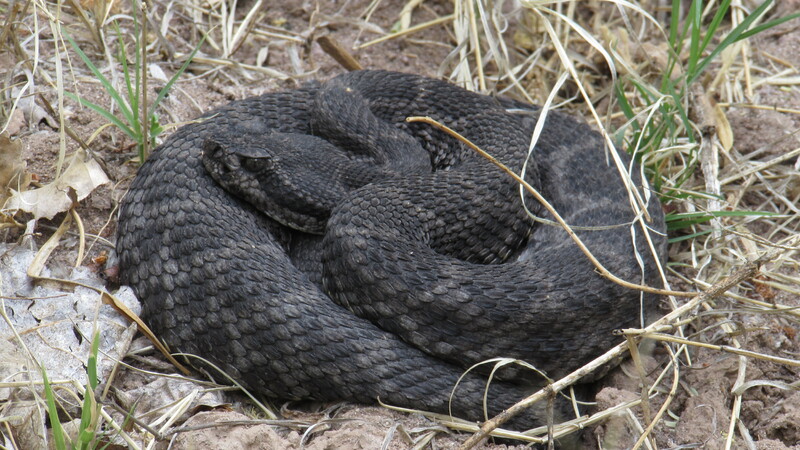 The start of this blog also coincides with the start of my current field season. 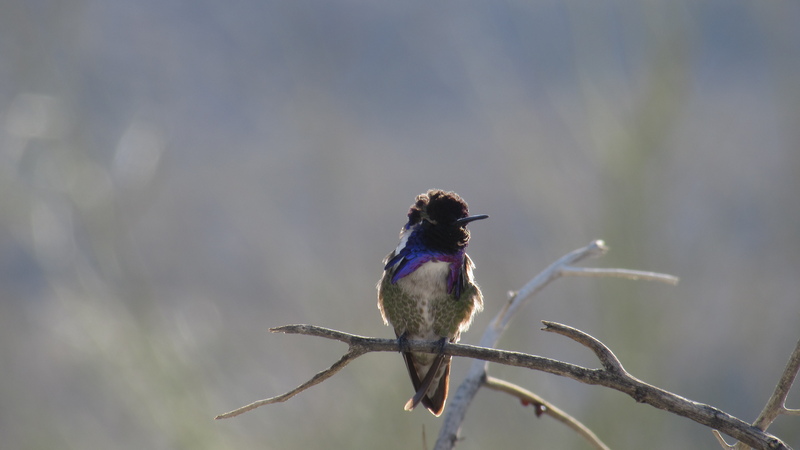 I am studying black-chinned hummingbirds at the Audubon Appleton-Whittell Research Ranch. I first need to say that this ranch is not open to the public, however if you are interested in visiting please contact the ranch staff (link). With that said, this place is amazing! It is a grassland littered with canyons and riparian areas (the land around running or dried up creeks and streams). Here are some pictures of the land and the different habitats I’m exploring. I’ve been focusing on the canyons and riparian areas to find my hummingbirds. I usually find males perching on a bare tree top, keeping watch on their territories (left). However, many of the trees these males have been choosing are in some tough to reach spots, like along the ridges of long canyons. I’ve only found a few males so far, but as I learn the lay of the land and speak to bird experts in the area, I expect to have much more success. In addition to finding hummingbirds, I’m finding so many other animals, including several species of birds, a plethora of deer, many lizards and snakes, and some interesting insects. I’m very excited to continue to explore this area and do my work here as it is such a beautiful place and full of interesting creatures! As I mentioned, I am a Ph.D. student at Arizona State University. I am getting my Ph.D. in animal behavior, and I am finishing up my third year. I have been doing biological research for seven years at this point, as I started doing research my first summer at college (2009). Its been quite a journey for me, that has lead me from cancer research, to ecological modeling, and finally to studying behavior in the field. I have always loved being outside and exploring the natural world. When I was young, my family traveled a lot, especially in the western half of the US, visiting a plethora of national and state parks. Two of my most memorable experiences were visiting Glacier National Park and a month-long trip we took to drive to Alaska, where I was able to see a huge variety of environments and wildlife. I have also spent considerable amounts of time in the South, such as in some of the beautiful old-growth forests and black-water swamps of South Carolina. As an adult, I continue to explore our natural world, both for fun and for my job! My research has taken me to many places around the world, including Canada, Panama, and Japan. I have worked with a reasonable diversity of animals, though most of my work has been on birds. I have also contacted some work on mice and rats, grasshoppers, and beetles. Outside of my research, I enjoy hiking, camping, and various other outdoor activities, as you will see through this blog. My current goal for the duration of my tenure at ASU, is to visit every wilderness area in the state. There are 90 wilderness areas in Arizona (check them out here), which vary in size and remoteness. So far, I’ve only been two 9 of them, so I have a long way to go! I will make sure to write a post about each one as I visit them, and I will write about the ones I have already visited as well. Tags: Arizona, Arizona State University, Biology, Hummingbird, Ph.D. 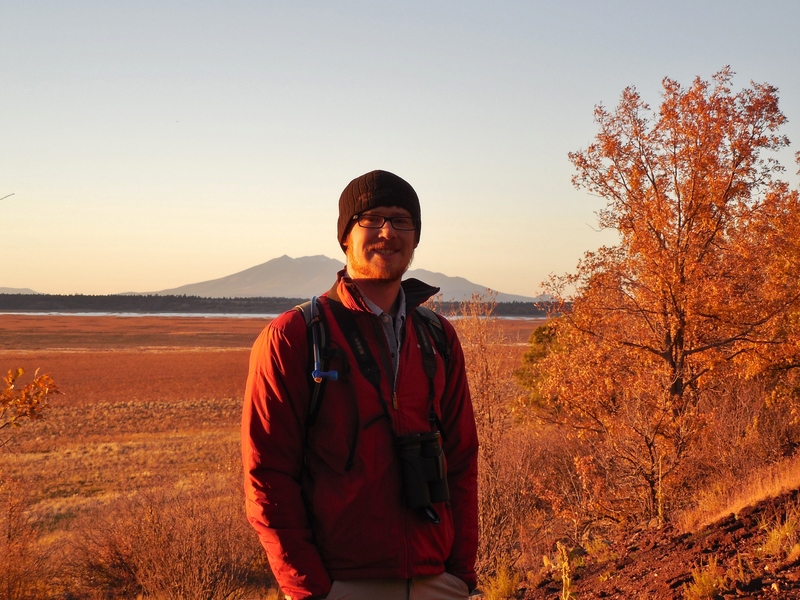 Welcome to Thoughts from a Graduate Student, Amateur Naturalist, and Adventurer! 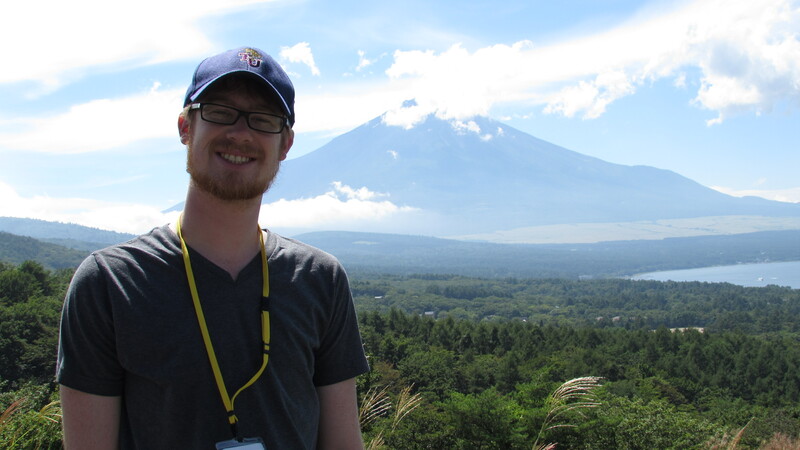 Me in Japan with Mount Fuji in the background. Hello everyone and welcome to my blog! To those who have followed some of my previous blog attempts – welcome back! My name is Rick Simpson, and I am finishing my 3rd year of my Ph.D. at Arizona State University. Through this blog, I plan to share my thoughts, opinions, and stories on a variety of topics, such as life as a graduate student, my travels across Arizona and elsewhere, and my research experiences. I may also write about and discuss cool and interesting papers as they arise. Additionally, because I am interested in colorful and exaggerated visual traits in animals, I will be posting as many pictures and other visual media as possible throughout my posts. Some posts will be long, while others will be short. In some, I might rant about something that bothers me, but I will keep that to a minimum. Ultimately, I hope that this blog will be both entertaining and informative! Finally, please give me feedback as I go, so that I can continue to improve.